There's a storyline in "Seussical Jr." about Gertrude McFuzz, a complicated bird with a single-feather tail. As the story waxes on, her confidence grows and she gets a glorious plume as large as her compassionate heart to parade around. It's the perfect analogy for the newly renovated Wood River High School Performing Arts Center, long a well-worn and loved venue for all manner of performance, despite its limitations and age. Like Gertrude, the auditorium will flounce its new tail feathers for the public tonight, April 25, with an assortment of entertainment and a snippet of "Seussical Jr." to inaugurate the new theater. The show will open Thursday at 7 p.m. and run on Friday at 7 p.m. and then Saturday at 1 p.m.
During a recent dress rehearsal, the biggest challenge for the actors, who've been rehearsing for other shows in a classroom for the past year, was getting them to spread their wings. 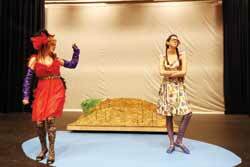 "Use the space on the stage," director Karl Nordstrom urged. And to those waiting by the new red curtains, he had to remind, "Hey, you guys can be seen and heard out here." Choreographer Julie Fox-Jones has fattened the actions of the script to maximize the use of the space, which is one reason Gertrude, played by Abigail Barton, gets so much room to strut her stuff. The overarching plot of the play uses "Horton Hears a Who" as its core and centers on Horton the elephant's endeavors to protect the people of Whoville, whom he discovers living on a tiny speck of clover. Other characters and scenarios from other Seuss books are sprinkled throughout the story with The Cat in the Hat serving as the narrator and devil's advocate, stirring the pot of conflict and keeping the story going. Though Nordstrom works with a well-versed and seasoned group of students, to enable them to be the first to use the new stage required scrunching things a week sooner, making preparations a bit stressful as the opening drew near. "This has been the hardest show we've ever done," he said while helping stage manager Kim Cortez coordinate the blocking. "But after two and a half weeks of work, we're in really good shape." While the adults haggled with the details, the cast was unflappable as they moved through a semi-dress rehearsal Thursday with early costuming being tried out with the help of local children's theater maven Nancy Harakay with help from Stephanie Smith and Mary Mills. One giant benefit of the new arrangement is the addition of his and hers dressing rooms. No more sprinting down the hall to an empty classroom to hasten a wardrobe change. They were practicing with the wrong music that day, but those details were on a list of things to be ironed out, along with how to run the high-tech lighting and sound system, which Nordstrom said would require some education to master. Footlight Dance director Hilarie Neely, who has brought talent from top theater companies like the Oregon Ballet Theatre over the years and managed to showcase their professionalism despite the limits of the previous auditorium, is helping Maddie Hendrix, Blaize Baca and Allie Jones to ease that learning curve. "With this new system, we have a lot more options," Nordstrom said. Beaming a little nervously, he said, "We've gone from 38 to 40 lights to more than 100." Audience members, used to trying to unobtrusively enter the auditorium through clunky doors, now enter through beautiful wood doors to a small lobby before another set of doors on each aisle lets them in, cutting down on the interruption. Once inside, they will enjoy plush new red seats, contrasting with the black stage with several sets of curtains. Most of the highlights are beyond the view, though, in acoustic enhancements and comfort settings. The design is sleek and modern. For the young actors, moving into the new space was not as dramatic as say, going from silent film to talkies, but it was testing the vocal prowess of some of the students. They will be wearing microphones, but still need to learn how to project and temper their voices differently than they had to at the Liberty Theatre in Hailey, where they held their fall performance. Cast members talked reassuringly about being ready, promising "family-friendly and commercial-free" fun. There's lots of excitement about being first—"amazing," "spring has sprung" and "so grateful" were some of the sentiments tossed about by the actors. The cast includes Drake Arial as the Cat in the Hat, Caroline Scarbrough as JoJo; Katie Walton as Horton; Hayden Mann as the mayor; Ruby Payette as Madame Mayor; Jason Black as a Wickersham Brother; Ian McKenzie as Judge Yertle the Turtle; Anik Zarkos as the Sour Kangaroo; Sammy Black as the Baby Kangaroo; Chloe Barrymore, Ali Avison and Taylinn Lake as Bird Girls; Omar Ocampo as the Grinch; Eva Sorensen as Thing 1; and Erin Marquis as a Who Family Member. Janet Delgadillo and Paola Ornelas are runners and do hair and makeup. When: 7 p.m. with a ribbon cutting and performances by the choir, drama department and orchestra. Doors open at 6:30 p.m. When: Thursday, April 26, and Friday, April 27, both at 7 p.m. and Saturday, April 28, at 1 p.m.
Tickets: $8 for adults, $5 for seniors and high-schoolers, $3 for middle-schoolers, free for elementary and under.